Solomon Islands in the western Pacific belongs among the technologically developed countries of the world. Nevertheless, the Solomon Islands has in recent years witnessed several information society projects aimed at connecting the Islanders to global information networks. In the most recent such project, One Laptop Per Child in Oceania (OLPC in Oceania), the Massachusetts Institute of Technology designed the so-called ”hundred dollar laptops” have been pilot tested in the western Solomons. Within the next few years, these laptops are planned to be distributed to as many 6-12 year old children across the world as can be done. The documentary follows the first pilot tests and the user experiences of these laptops in the Bekabeka village on the Gatokae Island. 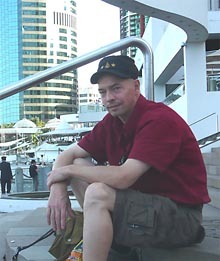 Dr. Jari Kupiainen is a cultural anthropologist and media culture researcher with specialisation in visual anthropology. He works as principal lecturer at the North Karelia University of Applied Sciences, programme in media and communications. He is also adjunct professor at the University of Joensuu. He is known as a student of Pacific cultures, especially the Solomon Islands cultures, and he has done anthropological field studies in the Solomon Islands since 1992. His research interests have included Solomon Islands crafts, material culture, the arts and their relationship with traditions (dissertation in 2000: "Tradition, Trade and Woodcarving in Solomon Islands"). More recently, he has also studied the information society developments in the Solomon Islands. He has also exhibited his Pacific photographs in several occasions (Joensuu, Espoo, Paris) and lectured widely nationally and internationally on the topics related to visual anthropology. After his 2007 field study and video research period in the Solomon Islands he has also concentrated on the making of anthropological documentary videos.